An indigenous, sticky variety. Fresh, earthy and nutty, growing at higher altitudes (+/- 2000ft). SEED SAVED and NATURALLY GROWN by a Lisu tribe in Mae Hong Son province, Northern Thailand. No. We support both heirloom and natural cross-pollination seeds and only source (DIRECT TRADE) from ORGANIC, SEED SAVING FARMERS. Partially, only the outer, inedible layer is removed ('husked' rice). Black rice is a WHOLE GRAIN with all nutrient-dense parts of the grain kernel preserved. Black rice is a rich source of ANTHOCYANIN, a phytopigment and powerful antioxidant, which renders our grain deep dark purplish in a similar way it does with blueberries. Rice contains NO GLUTEN and is an excellent starch for anyone with gluten allergy or sensitivity such as celiac disease. Why shorter cooking times for this black rice variety? Most Thai rice, like ours, is LONG GRAIN: tall and slim. When cooking rice, water reaches the core easier, hence shorter cooking times. One cup of rice takes about 20-25 minutes cooking time. How long can black rice be stored? Our rice is vacuum sealed with a SHELF LIFE OF 24 MONTHS. Rebirth Rice is a start-up company founded in 2016 by a young couple. He is a physician, she loves to cook. 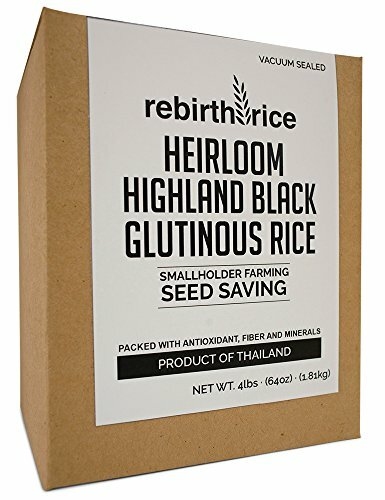 Rebirth Rice is based in Chiang Mai, Northern Thailand. Living here, we are constantly exploring regional food and our favorite kind of starch: invigorating, naturally pigmented rice varieties which we believe blend wonderfully with a healthy everyday life and whole foods diet. A delightful heirloom, long grain, fragrant, sticky black rice variety, grown and seed saved by a Lisu tribe in Mae Hong Son province at higher altitudes. Healthy and invigorating: packed with complex carbohydrates, insoluble fiber and mineral. A powerful antioxidant and anti-inflammatory! According to a Hmong legend, housewives loved this rice so much that at lunchtime no rice was left for their husbands and this variety was named the 'forget the husband rice, khao luum phua' in Thai. Current batch at Amazon arrived July 20. If you have any questions about this product by Rebirth Rice, contact us by completing and submitting the form below. If you are looking for a specif part number, please include it with your message.